Stop! Don’t Throw That Down The Garbage Disposal! Is My Water Too Hard? Don’t Ignore a Leaky Faucet! Before you throw that banana peel down the garbage disposal, stop and read our blog! Although it is super convenient and easy to use, your garbage disposal was not designed to chew up all your uneaten scraps. In fact, there are many items that homeowners throw down their garbage disposals willy nilly — items that definitely don’t belong there. So, this week we thought we would provide homeowners with a guide about what can and cannot go down their garbage disposals. In doing so, we are hoping to prevent some common plumbing issues. Your Sanford, FL plumber can also provide you with some great tips! Keep reading below to find out more! FOGs: FOG, or liquid fats, oils, and grease, should never be put down a garbage disposal. Though these liquids might seem safe when they’re hot, all three turn into a waxy sludge when they cool. This can easily clog your drain and allow other food particles to get caught in it. It is better to just let these liquids cool and throw them in the trash can. Unchewable food items: As a rule of thumb, if you can’t chew it, neither can your garbage disposal. Materials such as popcorn kernels, bones, and other solid food products should go in the trash can. Rice and pasta: Rice and pasta are quite soft, so your garbage disposal should be able to grind them up without a problem, right? However, both rice and pasta will continue to absorb water, causing them to swell up and cause quite a problem if they get caught inside the disposal. Coffee grounds: Sure, coffee grounds may seem harmless, as they are quite small. However, these tiny particles can gather and settle in your pipes, sort of like sediment. Plus, they are easily trapped by substances like fat and grease. Actual garbage: Paper or plastic materials should never be thrown down the garbage disposal. These materials can cause significant damage to the grinder blades and cause serious blockages. Hands: This may or may not seem obvious but in no circumstance should your hands enter the garbage disposal. Do not attempt to fix a jam with your hands, as it can be very dangerous. Instead, call a professional. So, What Can You Put Down It? Soft foods, i.e. yogurt and applesauce. Don’t be afraid to ask a professional plumber for more information about your garbage disposal. Knowing the difference between what can and cannot go down it makes a huge difference to the overall performance of your plumbing system. 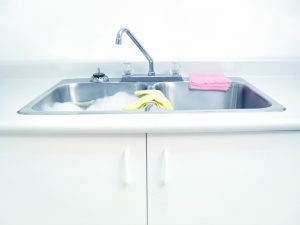 Remember, the best way to avoid issues with your garbage disposal—as well as your plumbing system altogether—is to schedule regular plumbing maintenance. Your plumber will be able to detect minor clogs and leaks before they become major. For all your plumbing needs, contact Modern Plumbing Industries, Inc.